for a long, long, long time ... my friends & i have been wanting to try the bristol, located on n. damen avenue in wicker park / bucktown. so one chilly fall evening, off we went. 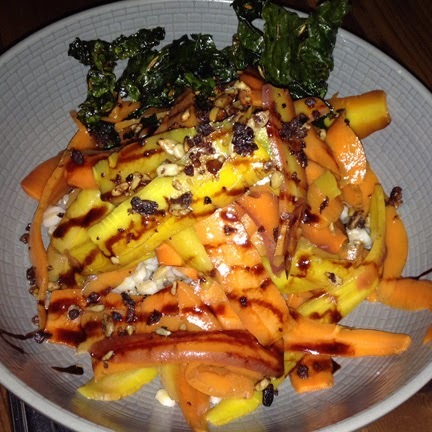 per their website : "in 2008, chef chris pandel opened the bristol ... his menu focuses on locally-sourced, seasonal dishes with a mediterranean influence. ... the bristol has become a staple for chicago’s local dining crowd, off-duty chefs, & visiting gastronomes looking for a great dinner or sunday brunch. the menu features handmade pasta, charcuterie, farm-fresh produce, & a nose-to-tail approach to cooking." beautiful. the bristol is super aware of dietary needs. i believe there is a whole separate vegetarian menu ... in terms of vegan, there are a few salads & a pasta (see below) ... but it's a super seasonal menu, so that's bound to change. barley, crispy kale & black olives. i was amazed by how actually delicious the smoked carrots were. not only that, but this was an awesome, hearty salad ... like actually filling (thanks to the barley). and every bite that had a black olive in it was especially tasty. duh. 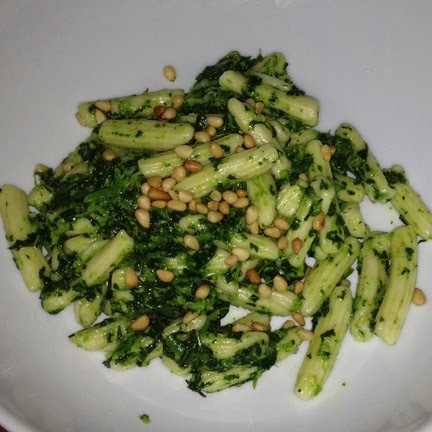 broccoli rabe & pine nuts. i love me some pesto ... and this? this was a perfect departure from the usual basil version. slightly bitter, but that's to be expected ... and the pine nuts added great texture. oh, and the pasta.was.fantastic. normally the vegan option of pasta is specifically not house-made. so i was very excited about this. highly recommended. the bristol is the type of place i could eat at over and over again as the menu changes ... and i'm quite certain i will ... looking forward to what spring has to offer!